I read about the updating of Santander’s visual identity today with mixed emotions (1). On the one hand, the company has remembered and refreshed what made the brand famous, avoiding the mistake of ditching distinctive assets that I posted about last week. But I did sigh with despair at how the article gives the impression that branding is mainly about a company’s logo. Below, I look at the good, the bad and the questionable about Santander’s logo revamp (below right). Santander’s UK business was created via the takeover of the Abbey National brand in 2004. In the 13 years prior to the takeover, Abbey National chopped and change its identity, most notably in 2003, when a multi-coloured makeover replaced the long-used red with a rainbow of colours and the rather exaggerated promise to ‘Turn banking on its head’. The relaunch cost a reported £11million, a big stash of cash back in 2003 (2). Step 2 – 2009: five years later, the Abbey name was replaced with Santander. Enough time had been left to create distinctive memory structure for the visual identity. Many customers may not have even noticed the change. And what about this latest change? The red colour and the flame have been retained. “The flame has helped make Santander one of the world’s most recognisable brands,” as Keith rightly points out. And if you look carefully, the typeface has been changed from ‘serif’ to ‘sans serif’ (smoothing off the twiddly bits on each letter), which does make it more streamlined. It also looks bolder, which should make it more visible. It is also good to read that some sort of testing has been done. According to the article visibility in the key mobile channel has been boosted by over 20%. 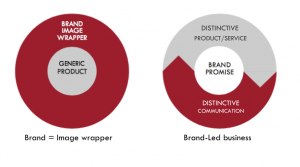 We have a long-standing battle to convince senior managers, especially those in service businesses, that a brand is more than just an ‘image wrapper’ made of a logo and communication. We try to get them to think about ‘Brand-led business’: driving the brand idea through the whole customer experience from end to end. So I cried into my Cornflakes this morning when I read the explanation of Santander’s new visual identity. But what was the answer ? Yup. The big brand idea is to tweak the logo. I just wish he’d led with this point, rather than ending with it. 3.The QUESTION: reversing red and white? “We’re keeping the red, but will increase our use of white backgrounds, helping us to stand out more in digital channels,” explains the article. I do wonder how smart this move is. 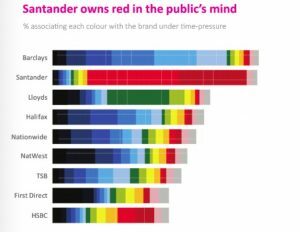 Research by agency System 1 indicates that red is a key distinctive asset for Santander, being strongly linked to the brand. This is based on testing where consumers are put under time pressure and forced to use system 1 thinking (below). This data suggests it will be important to continue featuring red prominently in the brand’s marketing, and not go too white, to ensure strong recognition is maintained. Marketers have a bad habit of over-selling logo changes. And the Santander article does make this mistake, although not as bad as previous logo change announcements I posted on, such as Yahoo and Uber. Now, if I was a Santander employee, I would wonder how much cash is being spent on agency fees and all the changes, in branch and online, to basically do 2 things: i. reverse the colours to be red out of white, and ii. tweak the typeface. In conclusion, hats off Santander for 13 years of fresh consistency. Coupled with the core product innovation of the 123 account that I posted on here, this approach has created significant growth for the business during turbulent times for financial services. I just wish the announcement of the fine-tuned logo had been just that, and not an over-trumpeted claim to be refreshing ‘the brand’.